These days, many of us possess Global Positioning System (GPS) systems in our phones, but a major limitation of these types of GPS’s is the fact that for the most part, they require steady cell or Wi-Fi service in order to function properly. For full coverage, we need to enter the realm of the standalone handheld GPS. These types of devices are also much more rugged and road-ready than the typical cell phone that isn’t ensconced in a bulky protective case like an Otterbox, for example. Also, as a rule a handheld is typically water and dustproof, which really lends itself to life on the trail where rain storms and shifting winds could do in your SmartPhone. Here is a list of some of the best handheld GPS units on the market, as well as a selection of pre-purchase considerations that you should take into account when buying one. *Price at time of posting. Current price may be different. Garmin, simply put, is one of the best manufacturers of standalone GPS systems on the market today, and as a result, you’ll find that all of our picks are made by this manufacturer. 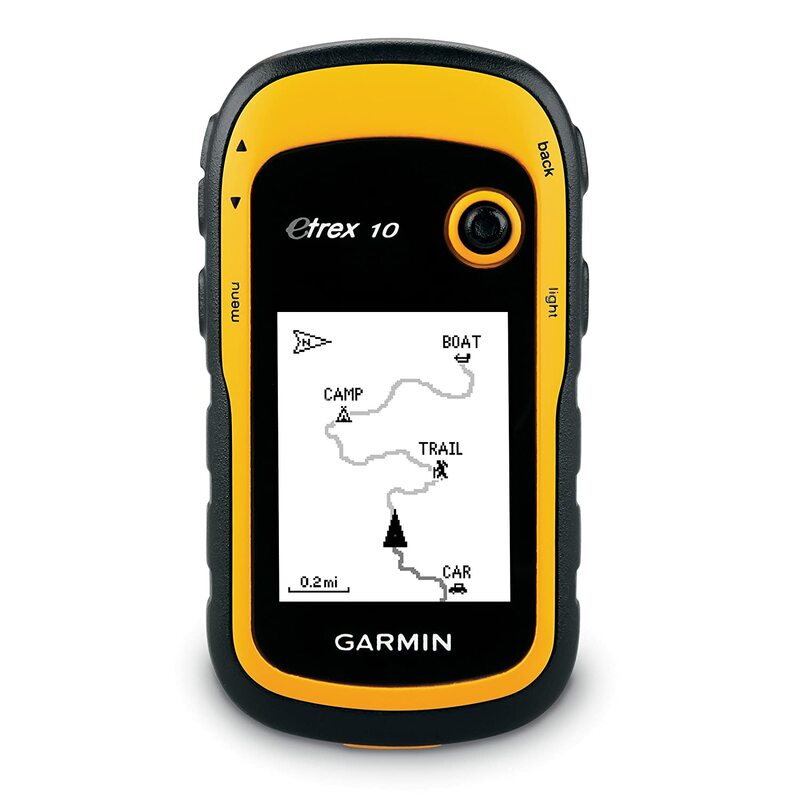 The Garmin eTrex 30x shines as our gold pick because of its great features, reliability, and steadfast durability. This device is perfectly designed for carry and use. The device measures in at a 2.1 x 4 x 1.3 inches. While that is small enough to fit in the palm of almost any hand, Garmin still managed to imbue in this device a level of functional ease that makes this GPS seem at home in the palms of hikers with larger hands as well. The buttons are well-placed, the control thumbstick is agile, and the chassis is almost entirely without obstruction. The eTrex is also astoundingly light, weighing only five ounces. Garmin went for a gray and black color for the design and the material feels like a comfortable rubberized plastic. Maps can really bog down the hard drive of any device as they tend to be in the larger range when it comes to file size. The eTrex 30x comes with 3.7 gigabytes of on board storage and accommodations for an SD card with a 64 gigabyte capacity. This handheld GPS doesn’t come with every detailed map pre-installed but it does come with a preloaded basemap that includes shaded relief. More detailed maps are available and have to be purchased on Garmin’s dedicated website. To upload these maps, the device connects to your computer via a mini-USB cable that attaches to the top right hand corner of the device. A dedicated GPS is no use if it loses power mid-trek. It needs to be easily repowered, have long lasting functionality, and incorporate these features while still managing to keep a svelte form factor. The eTrex 30x doesn’t recharge but is powered by two AA batteries. On a single set of these batteries, the eTrex 30x will last for about 24 hours, which is a goodly amount of time, especially considering you can bring additional batteries with you for truly long treks. Since you’ll most likely encounter inclement weather when you’re out in the field geocaching, this device is water resistant and can be submerged for up to a half an hour in one meter of water. When the weather is not quite so fierce, this GPS’s high-resolution display has over 65,000 colors and is easily sunlight-readable. Garmin truly created a feature rich device when they designed this GPS. To start, this device includes an electronic triple axis compass that operates when you’re moving or even when you are standing still. This compass also displays different types of route info and offsets when you load in your destination and provides a heading to keep you on course and will tell you if you veer off of it. The device also features trackback; if you get lost this GPS will tell you how to get back to a preset point. Similar to the three axis tilt-compensated electronic compass, this device also includes a built-in altimeter that accurately measures your altitude. A great feature of this is this included feature is the ability to reset the device when you want so that you can get an accurate estimation of how far you’ve traveled on a vertical plane. In addition to these features, an on-board trip computer that measures your trip stats is included. The metrics it provides from reset are: max speed, current speed, sunset/sunrise time, and total distance travelled. With all of these features, it seems that Garmin wants you to have detailed metrics for each of your trips, whether they are up a steep incline or along a flat track. For even more metrics such as heart rate, cadence information, or even local temperature, Garmin has included functionality that allows you to wirelessly connect to their ever-growing list of external devices that provide these points of interest. For the most part, most GPS devices, even the ones included in SmartPhones, utilize the U.S. military satellite system to keep you on path. For this series of GPS devices, Garmin utilizes the Russian GLONASS satellite system as well as the traditional U.S. system of satellites for GPS calibration. This results in impeccable navigation that almost entirely ignores obstructions like forest canopies or dense cloud cover. With two distinct satellite systems for support, it’s really hard to get lost with this device. You can get our number one gold pick travel GPS on Amazon for around $224. This is a well reviewed item, with users on Amazon grading it a five star pick 58 percent of the time, and 24 percent of the users are grading it at a four stars level. This equates to a very reasonable 82 percent satisfaction rate. Our silver pick is loaded with almost as many features as the gold and really highlights the reliability of the Garmin brand in the handheld GPS space. For many years, the GPSMAP 62S was something of a gold standard when it comes to handheld devices of this type and even though newer devices like our gold pick have some great features, this device still is amazing in realms of longevity, durability, and reliability. At 6.3 x 2.4 x 1.4 inches, the device is relatively large, and at over seven ounces, it’s also quite heavier than the gold pick, but this larger size also lends to the devices overall durability. On first glance, you might notice that this unit has a dedicated antenna built into the chassis. While it does jut from the device similarly to an old-school cell phone, the additional hardware antenna means that this device will maintain satellite connection in the majority of outdoor situations. The majority of the buttons and the directional pad are located on the front faceplate of the device. The only button that isn’t aligned to the front of the unit is the power button which is positioned along the right side. Each function button is durable and made of a rubber-like material that won’t fall off even after extended use, something not every handheld GPS can attest to. This model, which includes some additional navigational features, is tan and gray and looks great from an aesthetic point of view. On board this device is 1.7 gigabytes of storage. There is also micro SD support for up to an additional 32 gigabytes of storage. 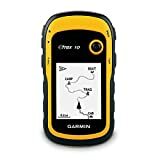 Similarly to the eTrex 30x, this model comes with reasonably detailed global maps pre-installed, if you want more up-to-date and detailed information, Garmin offers more maps through their digital site. 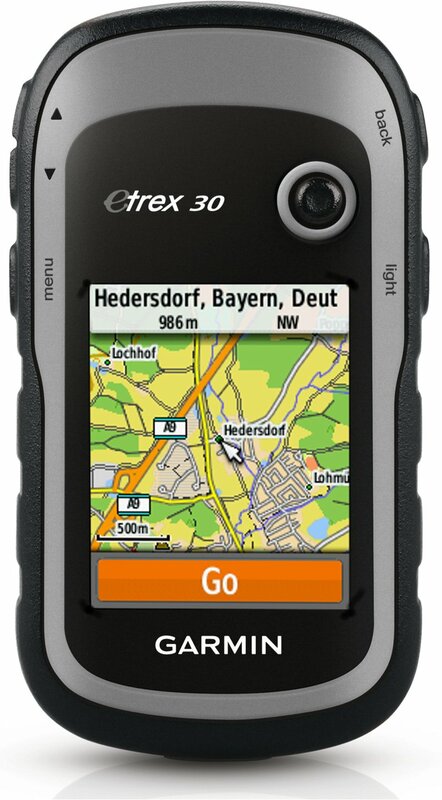 Also like the eTrex, the GPSMAP uses a mini-USB connection for the high-speed uploading of additional content to the device. The sun viewable screen has a 160×240 resolution and displays 65,000 colors. Also, if you tend to do a lot of night hiking, this device’s screen is backlit for ease of use under low-light situations. The unit is powered by dual AA batteries that last for about 18 hours with several functions running. While this device lacks the ability to float under its own power, it is waterproof to the IPX7 standard. This means that while you can submerge the device for several minutes, at moderate depth; you don’t want to expose it to prolonged water exposure levels as this may hinder the device’s functionality. From a feature point of view, this device includes a three axis tilt-compensated electronic compass and a barometric altimeter that measures bearing as well as altitude. Similarly to the gold pick, these are a great for finding your way and tracking where and how far above sea level you’ve been. Also included are a proximity alarm, waypoint averaging metric, and a route planner. More generalized, “extra” tools included as features of this handheld GPS are a sun and moon chart, a calculator, an alarm clock, and a stopwatch. Our silver pick is available from Amazon at $269. For positive reviews, 58 percent granted this handheld GPS a five star rating, while 21 percent granted it four. Overall, 79 percent of Amazon reviewers had a positive experience with this handheld GPS. This device is the only touch screen handheld GPS unit on our list and as a result there aren’t quite as many buttons as are present on some of the other units. The Oregon 450 has been exceedingly well received by outdoors folk, geocachers, and hikers alike. The Oregon series of Garmin GPS’s is also considered their most premium offerings and the included features reflect its elite status. The design of the 450 is very minimalist. Without the buttons of the prior models it really fits well in the palm of your hand. It also has rounded, rubberized edges that make gripping the device really easy. At a somewhat pebble-like 1.4 x 2.3 x 4.5 inches and seven ounces, this unit feels great in the hands. It is also colored in two distinct shades of gray, with orange highlights positioned along the top and sides of the device. Power-wise, on this device you can expect about 16 hours of non-stop functionality from two AA batteries. On board the Oregon 450 is around one gigabyte of internal memory. While this is relatively small for this type of device, it’s easily bolstered by adding a micro SD card, allowing the device to accommodate an extra four gigabytes of space. The screen is about three inches diagonally and displays 65,000 colors on a 240 x 400 display. Possessing a level of waterproofing similar to some of the other Garmin units, you can expect to submerge this device for about a half an hour at a maximum depth of one meter. The defining features of this handheld GPS are certainly the intuitive touch screen and excellent user interface. The screen itself is very responsive, and in a world where so many devices employ the tech, you won’t feel like you’re struggling to click any of the on-screen buttons. Out of all the Garmin units on this list, this is also the only one with a fully customizable on-screen dash board. You can place any of the included widgets anywhere on the screen for a truly individualized experience. Another great feature of this device is the included 3D view. 3D view allows those who are embarking on a trip to truly get a three dimensional perspective of the terrain. Oftentimes with handheld GPS’s, hikers don’t fully get an idea of how high certain natural formations are, with 3D view, you can manipulate the view of the area’s terrain to truly get a idea of the height and width of any trail feature. Mapping is also a cinch with the Oregon 450, it already comes pre-packaged with detailed maps of state and local parks and forests; complete with trail and stream information. Uploading maps is also made very easy on this device as it employs USB 2.0 for crisp data transfers. This device includes a compass and a barometric altimeter for helping you navigate vertically or horizontally. 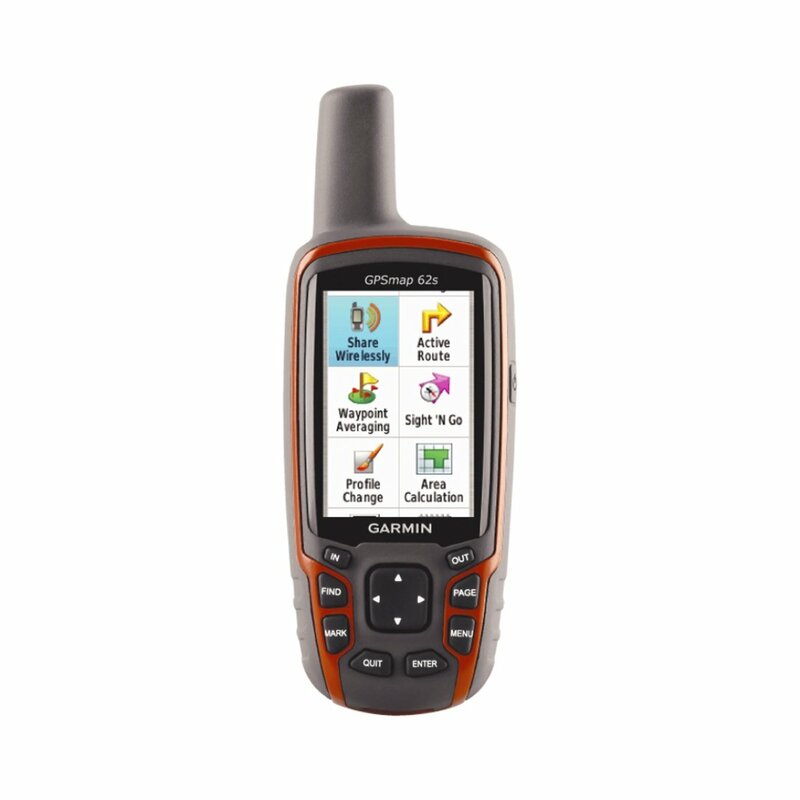 Similarly to the eTrex series, wireless connectivity with other Garmin devices is also available with the Oregon 450. On Amazon, this device can be purchased for $359. The Garmin 450 has also been granted five stars by 52 percent of reviewers and four stars by an additional 25 percent. 77 percent of reviewers found this device to be a worthy investment. 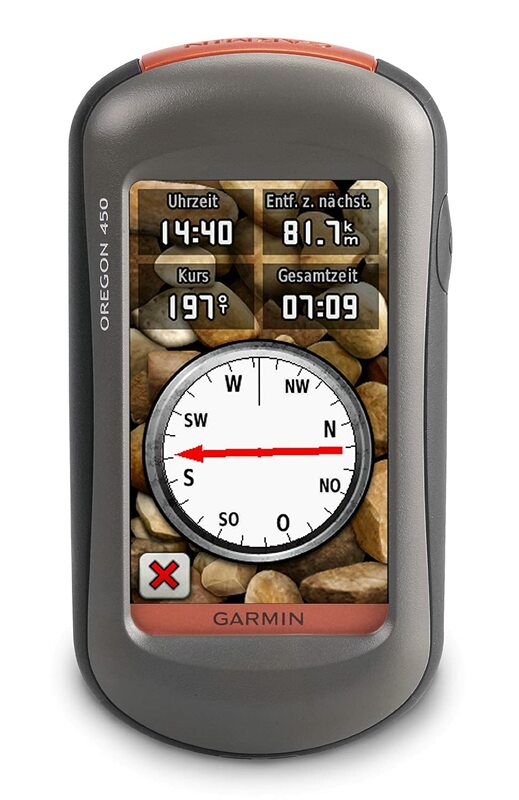 If you don’t have a large budget to purchase the handheld Garmin devices we’ve mentioned previously, there is still a great option for your backpacking/geocaching needs. Our “Ballin on a Budget” entry has many of the most important features included in the more expensive devices for under a hundred bucks. As part of the eTrex series, the eTrex 10 favors the 30x in many ways. It has the same side mounted buttons as well as the same type of thumbpad for navigating the various on screen features. The biggest difference is the screen itself, which is a relatively low resolution monochrome. Measuring in at 2.2 inches, and with a resolution of 128 x 160, the screen is about the same size as the 30x and definitely provides accurate info for your adventure. From a materials standpoint this device is primarily composed of a rubberized plastic that stands up to gradual wear and tear admirably. The soft material makes the handheld GPS very easy to maintain a grip on and also makes the tiny 1.3 x 4 x 2.1 inch device very impact resistant. Like our previous entries, the eTrex 10 has IPX7 water resistance to help the device from taking damage from any incidental water that it might encounter on your treks. Unfortunately, there is no Micro SD card expansion for this unit and the internal capacity is in the low megabytes. Additional maps are still available to be uploaded to the device through the mini USB interface, but be forewarned: since there is little capacity, this can fill the device quickly. As this is typically rated as a GPS for the neophyte or budget conscious hiker, the low capacity doesn’t really interfere with most of the functionality of the device itself. This device, as it contains little bells and whistles to provide extra drain, has the best battery life of all the models reviewed here. Under full device stress, you can expect an astounding 33 hours of battery life. With some of its more draining features turned off, this will extend the device to a nigh-unfathomable 41 hours of charge on one set of the AA batteries that it uses for power. There is an included compass that operates when you move. The most useful feature of the eTrex 10 is the fact that Garmin still managed to include in this device the ability to access the GLONASS system of satellites. Since having two distinct GPS systems helps the device position much more accurately, this added functionality certainly adds a level of route protection to a relatively cheap device. The eTrex 10 can be purchased on Amazon for around $89. This device is also fairly well regarded with 45 percent of reviewers on Amazon granting it five stars, and an additional 18 percent giving it a four star rating. For a handheld GPS that’s under $100 to have a positive review percentage of 63 percent is great. In recent years, geocaching has really taken off. Geocaching is used by many outdoors enthusiasts as a way to add a little adventure to their lives. Geocachers leave a treasure at a certain set of GPS coordinates that fellow geocachers seek using clues and hints. Many modern handheld GPS units have support for geocaching in one way or another. Some units have paperless Geocaching support and some even include proprietary software that gamifies the activity to a higher degree. If you are a geocacher and are looking for a good handheld GPS, take a look at the features that pertain to geocaching before you make your purchase. Anyone who’s been on a trail knows that there are many environmental factors that can make any trek much more difficult. For the hard road ahead, make sure that your GPS can withstand any of the trials that the road provides. Your handheld GPS should be IPX7 water resistant, resistant to dust, and able to take a tumble from time to time. The belt clip shouldn’t release easily, and any internals, such as the mini USB interface should have a rubber cover to protect your device’s delicate components. Getting lost isn’t just an inconvenience, it can be life threatening. A three axis compass with heading information is an incredibly useful tool for hitting the trail. This will ensure that if you get caught in a circumstance where a forest canopy is hindering your GPS signal, you can use the digital compass’s direction indicators as a way to get back to more navigable paths. Trackback functionality is also a great feature; it will simply help you find a set waypoint that you visited previously on your trip. Losing reception can be a difficult situation. Sometimes going deep into a gorge or having satellite reception blocked by a natural formation or canopy will cause you to lose reception on your handheld GPS. Some GPS’s have an extra layer of protection from this scenario by accessing navigational triangulation from two different sources; both the U.S. and Russian GLONASS satellite systems. If you are going to be hitting remote places often, this extra functionality may help you stay on track. Exploring the great wide open is one of the most rewarding pursuits imaginable. Whether it’s a geocaching expedition, a trek along a beautiful creek, or a climb through rocky vistas, a system to help you navigate through the unknown can certainly come in handy. Handheld GPS’s are a great tool to add a bit of order to the sometimes chaotic experience of exploration. When searching for a handheld GPS, make sure to consider all of the aspects of your explorations before you pick what will invariably be a very useful travel companion.